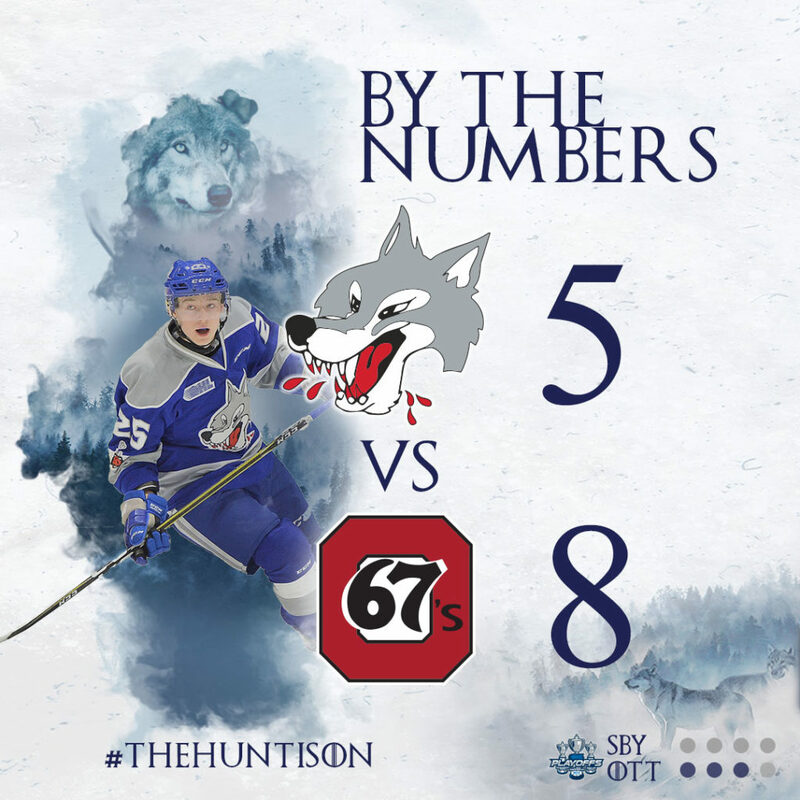 The Sudbury Wolves welcomed the Ottawa 67’s for Game 3 of their seven-game series Tuesday. In a fast-paced game, it was the 67’s who prevailed forcing the Wolves to drop the contest by three goals with an 8-5 final. Final shots on goal were 41-26 in favour of Ottawa. In the first period, Lucas Chiodo opened the scoring for the 67’s to force the Wolves to trail 1-0. Unable to get a hold on the high-flying rivals, the Wolves remained behind their visitors by one after 20. It was an intense second period as both teams were neck and neck. Shane Bulitka buried one on the power play to tie up the game at 1. The 67’s were quick to respond as Lucas Peric beat Ukko-Pekka Luukkonen to steal back the lead. Not 30 seconds later, Owen Gilhula ripped in a wrist shot to bring it back to a tie game. By the end of period, the Wolves notched one more short-handed from Macauley Carson. However, the 67’s added another two, to make it a 5-3 game in favour of Ottawa. Despite the Wolves scoring another two goals in the third from Adam Ruzicka and Jack Thompson, the 67’s were red hot putting in another three goals. In an effort to close the gap in the remaining minutes of the game, Luukkonen got the nod to head to the bench for the extra attacker. Unfortunately for the Wolves, Kyle Maksimovich scored his second of the night on the empty net to lead Ottawa to an 8-5 final. The Wolves will look to hunt for a win on Thursday when they take on the 67’s in Game #4. Tickets for Game 4 are available for purchase online at sudburywolvestickets.com or at the arena box office.